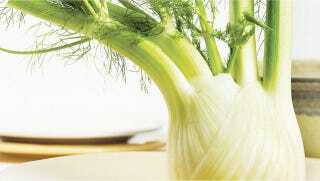 Tonight's open thread is brought to you by fennel. Let's all thank the great bulb for hosting this semi-nightly post where off-topic conversation thrives. After a hard day of dealing with the death of Guitar Hero and the threat of even more Call of Duty, let's all take a moment to share better, more enlightening news with the group. Like the news that I'm about to chow down on some delicious fennel! Hell yes. Perhaps some of these non-fennel items will encourage you to talk amongst yourselves. Spider-Man joins the Fantastic Four - Following the death of the Torch. BTW, didn't Spidey already do this? The photographs of Christian Stoll - Are beautiful. Chris Ware's poster for Uncle Boonmee Who Can Recall His Past Lives - Is beautiful too. Daily diet soda tied to higher risk for stroke, heart attack - Thank goodness beer is so good for you! Great Doctor Who infographic - For noobs!